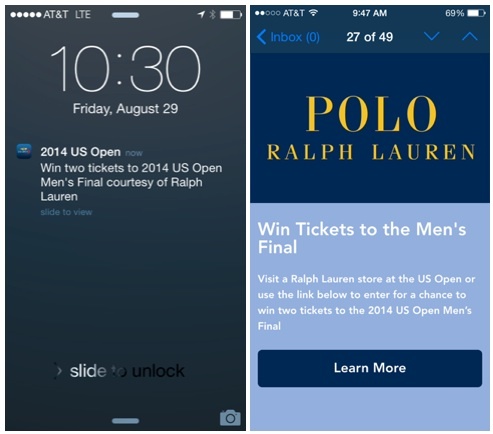 The end result, according to Urban Airship CMO Brent Hieggelke (who answered my questions via email), is a more precise approach to targeting promotional push notifications, one that uses Gimbal’s proximity beacons as well as Apple’s iBeacons. “Gimbal brings the most precise, real-time location and proximity data to trigger messages within Urban Airship’s targeting engine, which adds segmentation attributes and conditional automation rules to ensure the most relevant and responsive messaging possible,” Hieggelke said. Now we get a lot of pitches for marketing campaigns that use iBeacons and geofencing, but Urban Airship and Gimbal seem to have enlisted some big, high-profile events as clients, including the US Open, South by Southwest, the Tribeca Film Festival, and the Cannes Lions advertising event. For example, the US Open (for those of who aren’t sports fans — it’s a big deal in tennis, okay?) combined a geofence for the Tri-State area, 20 on-site beacons, and Urban Airship’s data about in-app behavior to send targeted notifications for things like last-minute ticket offerings and sponsor messages. Hieggelke said other businesses that could take advantage of the partnership include retailers who want send messages to in-store customers that are targeted to their interests, and hotels that send customer satisfaction surveys to people who leave the geofenced area. Anyway, the two companies will be talking about their partnership in a webinar on Oct 29.